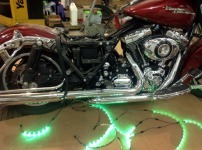 A customer brought his 2009 Harley bike to us and wanted to do a little special "glow" lighting for the big Harley party in Milwaukee this summer. We took about 4 hours and put a Brite Lites custom touch to the bike. 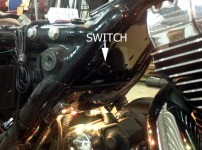 We have detailed pictures, tips, and suggestions for any bike install. We also made up a PDF file you can download to help you in your install, or at your shop if you install for customers. These are only suggestions, but things that may help you in your install or simplify the learning curve on a new product. Because this bike is a Bagger, I used a full Kit, plus 2 extra 20" strips to really light up the back of the bike. (Extra strips are for sale on our web site individually). I take time to route and hide the LED strips. From walking around the bike, it is very hard to see anything that we added. From the routing to the tiny micro switch, it is very discrete. Even the remote "EYE" is hidden between the seat and tank (I used a Sharpie marker to color it black). The pictures below help show the step by step process to do a good install. I took about 4 hours to do this bike and triple checked every step of the way. Click on the pictures and you can get a larger set to view for more details. These lights are available from any dealer that gets parts thru Drag Specialities, Bikers Choice, Parts Unlimited, or Tucker Rocky. 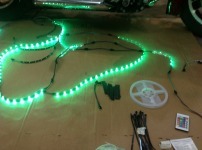 Or, if you like, the link on our web site can get you a set shipped direct from Brite Lites headquarters. Finished bike - blue glow! Here the bike is in the shop yet with the lights on the FADE program. I have it going slowly thru the colors and it is my favorite by far. Another picture of the bike in the shop. All the shop lights are on, so when it is dark, or even getting dark, this baby is a great eye catcher! 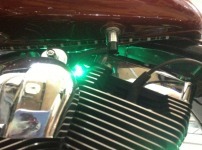 We check and light up all the parts in the order that they will be installed on the bike to get ready for the install. Here I have the strips connected the way I will install them and configured, so it makes the final install much simplier. A little planning goes a long way for a deliccate project like a street bike that people will analyse greatly! All of the 6 strips in the kit can be cut to the length you desire. If you notice in the pictures, I have even cut off the unused terminals on the ends to keep it clean. Be careful to cut pretty close to the cut line. It is on every 3 LEDs and easy to identify. If you cut too close to an LED, you will mess up the light coming from the last 3 LEDs on that string. Here is a shot under the gas tank looking up from the ground at it. 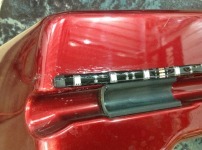 I have installed the LED strip so it is up under the tank rolled edge and tucked under the motor. I had to take the tank loose and raise it up to do this, but when done it makes the motor shine! When sticking the LED strip to the bike, the surface needs to be clean and dry. A heat gun is good to warm up the strip and 3M adhesive, and then press it on well. After it is stuck in place, test the light to be certian you didn't do something wrong, and then the final step is to secure it with some good silicone. We use Lexal brand as it stays clear over time. 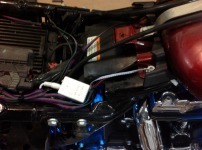 Here is a picture of the simple wiring harness I made for this bike. It had a trickle charger socket located off the battery, so all we did was take a spare trickle charger connector, a micro switch (this one is a 2 dollar one from Radio Schack) and connected it to the input wire for the control module (white wire). The frame on this bike had several good options for mounting a switch. In the center, right in front of the battery, was several small holes, so we took the one to the right most, (so on the stand the switch was more available from off the bike), and installed our little micro switch in that location. No drilling or mods to the bike at all. 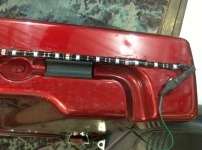 The wiring is in the battery box and up to the top where the control box is located. Very simple way to route power. Also, because we tapped out poewr from the trickle charger port, when the bike is in storage, all you do is unplug the LED strips and charge the batteery. I typically tuck the control module box in a central location on the project. For a bike, I like to go under the seat. It makes the wire routing very simple and gets the infra red "eye" in a good location for the remote when the bike is parked. I also like to tuck up all the spare wiring from the cables next to the control box to keep things clean. On this bike, I home run most all the LEDs so I had made a 6 channel cable splitter to make it simple to route to each strip. This is the actual remore with the kit. It is very compact and has several cool features. The colored buttons allow you to pick any color shown and the upper l left 2 buttons allow you to dim or brighten andy color. The gray buttons on the right side are programed and allow you to run a pre-programmed sequence of the lights. The upper 2 left buttons slow or speed up and of these functions. Fade is my fav!